An area of the city with a vibe like no other, Digbeth is a real hotbed of creativity and energy and nestled among the traditional manufacturing companies are some of the best bars, stores and clubs you&apos;ll find for miles around. At the heart of all this activity is the celebrated Custard Factory cluster of small businesses, retailers and restaurants. 1. HAVE YOU HEARD ABOUT ALFIE BIRD&apos;S? Set in a poolside location at the heart of the Custard Factory, Alfie Bird’s is Birmingham’s newest food and music venue. Expect a laid-back atmosphere, funky decor, unique experiences and a lot of great live acts. Downstairs it’s gourmet stonebaked pizzas, burgers, pretzels and bagels, washed down with craft/world beers, ciders, wines and fine spirits. Upstairs, Libby’s cocktail lounge features cocktail classics with a twist plus special bespoke recipes dreamed up by expert mixologists (try the Tequila Colada, Earl Grey White Lady or Rude Cosmopolitan in a tea cup). For music lovers, a secret bookcase door in the downstairs bar leads to the Ooblek, a 400-capacity live music venue, which holds live touring bands in the week and Saturday club nights. Fazeley Studios is a place like no other, which will completely transform your ideas on Digbeth. The grand gallery reception is set in a restored 1890s chapel and decked out with sumptuous sofas and pre-Raphaelite art in the archways. The building mainly functions as creative and digital offices, wedding and event space but right beside the landscaped courtyard is Fazeley Social, a cafe/bar that serves as the meeting place for the city’s creatives and all who visit Digbeth. We often hear headlines lamenting the death of the high street, but Birmingham is bursting with great independents. The Custard Factory has more than 30 unique, fun shops to suit all ages and budgets. It includes everything from vintage clothing to modern jewellery and urban indie labels, bikes, art, skateboards, cosmetics, teddy bears and furniture and interiors. The longest standing shop is Urban Village, a true institution among Birmingham’s independents that has been going since the 90s. It features vintage clothing and accessories, from all decades with a focus on the 1960s & 1970s. For modern urban trends head to Provide, a lifestyle and clothing shop selling a graphic-led line of clothing and accessories as well as books, magazines and also holding regular exhibitions. The internationally renowned Sara Preisler gallery showcases beautiful, contemporary jewellery, along with ceramics, silverware, textiles, wire sculpture, glass and photography, both from Sara’s own collection and over seventy of the UK’s leading designer makers. Between the Custard Factory’s two fantastic independent record shops Milque and Muhle and Left for Dead your will almost all genres of music in vinyl, CD or cassette, along with music fanzines, comics and prints. Widely thought to be the ‘birthplace of Birmingham’ it is not surprising that Digbeth is home to the city’s oldest pub, The Old Crown, which dates back to approximately 1368. The timber clad, Grade II listed building holds a charming pub that is a firmly established favourite of Digbeth’s creative and Irish communities. Eastside Projects is an ever-evolving space run by practicing artists who pull in both local and international talent, such as Dan Graham, Mike Nelson, and Liam Gillicks, and currently the artist and musician Bill Drummond. The space always has a packed programme of exhibitions, installations and talks. It will never look the same twice as there is constantly a new work bold, visual work in progress. A great time to catch the gallery is on the first Friday of every month, when it teams up with other venues around Digbeth for late-night openings and special events. On June 6, Eastside Project’s ‘First Friday’ special will be an epic exhibition 25 paintings by Bill Drummond. Other great arts spaces to check out include VIVID and Grand Union. Entering Le Keux Vintage Salon in the Custard Factory is like stepping into a 50s film set full of golden age glamour. It offers a range of vintage beauty treatments and experiences for women and has recently also branched out into the ever growing male grooming market. The beautiful 50s diner style salon offers vintage hair and makeovers, facials, waxing, manicures, pin up photo shoots and the chance to buy vintage clothing and homeware. It also does private party packages for birthdays and hen dos such as burlesque classes, afternoon tea, fascinator workshops and cocktail making. The Rockabilly Barbershop includes a games room with full sized pool table, quiz/arcade games, poker and roulette tables and chill out spaces. For stag dos and celebrations with a twist, book activities such as poker lessons and DJ Vinyl Masterclasses. Digbeth Dining Club is a foodie’s fantasy. Every Friday it fills the streets with the delicious smells of sizzling street food from the finest locally sourced traders, with a rotating rota of stalls serving up different flavours and cuisines each week. Winner of ‘The Best Street Food Event in the UK’ at The British Street Food Awards 2013, it is truly putting Birmingham on the map. The setting is Spot*light, an intimate, shabby chic urban warehouse nestled under the Victorian railway arches, with both indoor and outdoor seating. Get there early if the Meatshack is on the menu because its juicy burgers packed with ‘dripping filthy goodness’ are so popular that they tend to sell out. Other highlights include the best hotdogs in the Midlands from Big Daddy’s Diner; the fresh Asian flavours of Canoodle; homemade dumplings and Caribbean meat and fish dishes from Esmes Seafood Kitchen and Bournville Waffle Company, sweet treats served up from a beautiful vintage caravan. Almost every Saturday The Custard Factory hosts daytime fairs, festivals and markets with stalls, live music and entertainment. 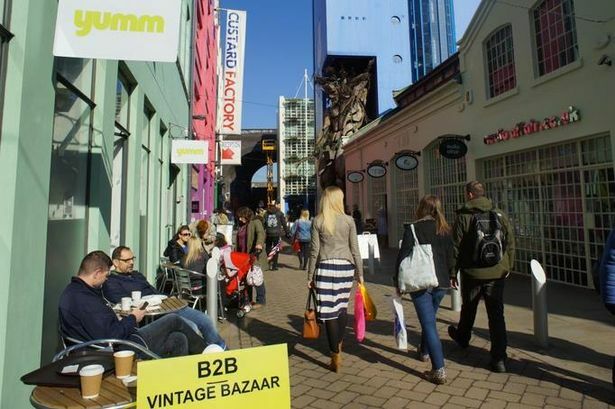 The bi-monthly B2B Antiques and Vintage Bazaar is a treasure trove of furniture, glassware, clothing, accessories, upcycled items and countless other discoveries and also features a pop up vintage tea shop and brings thousands of people to the site. Another vintage regular is Judy’s Affordable Vintage Fair, the UK’s largest travelling vintage marketplace which is popular with families, fashion fans and student alike. Each season it brings more than 40 traders to the Custard Factory selling fashion, furniture, accessories and crafts and haberdashery. The events are not always Vintage themed. On the first Saturday of every month is Skett’s Fine Food Fair, where the wholesome fresh produce of traditional farmers’ markets sits alongside funky modern street food and streetwear stalls, in a rich mix of independent local traders. Tucked away in the Custard Factory is a gem of a theatre/cinema space which has been waiting for its chance to shine. It has already been the venue for some fantastic social cinema nights and festival performances, but now it is being polished up and relaunched as The Mockingbird Bar and Theatre and will feature a packed programme of entertainment. With a 101-seated maximum capacity, it is an exclusive space which will offer an intimate, atmospheric experience in live events and unconventional cinema. The Mockingbird Theatre will embrace new and creative art in all its forms, inspiring the next generation of storytellers, musicians and film makers while also providing a platform for undiscovered gems of the past. It will also have its own café and bar, specialising in the finest liquors and unusual beers and ales. Some of the largest and most famous club nights in Birmingham take place at The Rainbow Venues, a collection of unique event spaces. They include a Victorian pub with quirky decor such as a retro games consoles and a life-size Doctor Who tardis. There is also a warehouse and garden, cellar, roof top mezzanine, courtyard, scaffold yard and arches which together can accommodate up to 10,000 people. The Rainbow Venues’ eclectic programme includes both regular club nights and one-off events and festivals and has featured everything from the heavy hitters of the local indie-music scene to Annie Mac, Basement Jaxx, world class DJs and the biggest names from the worlds of house, techno and bass.